The film’s central character is Mette (Febe Nilsson), a rather callous and rebellious 19-year-old neo-Nazi gang member, whose day job is taking care of old and sick people from whom death seems to approach way too slowly each long and painful day. The irony in Mette’s icy demeanor and her day-to-day responsibilities creates an interesting series of possibilities that are both amusing and provocative. Mette eventually rediscovers herself and her own restrained longing for love and acceptance as her life becomes tightly intertwined with the varied lives of the old people that she interacts with everyday. They have all become characters in a unique fairy tale world, and as she realizes this, she is changed forever. 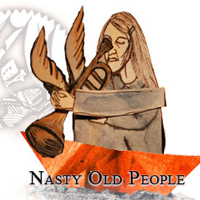 “Nasty Old People” brings to mind the classic follies of the young, the drama of old life, and the adventures throughout the lives of the young and old. Kudos to Nilsson and Karin Bertling (Elsie, an old woman given to sexual thoughts) whose fascinating and edgy portrayals gave justice to the story and its subplots in the film. “Nasty Old People” is a debut production by filmmaker Hanna Sköld, who had to make a private loan of 10,000 euros to produce the film, which was released under Creative Commons license — an unprecedented move in Sweden’s film history. Sköld had cut costs by distributing her film first via The Pirate Bay. From the start, Sköld had intended for her film to be available to the public, be remixed over and over, as long it remains properly credited by remixers. The subtitles and the film itself as a DVD formatted ISO file [3.6 Gb] may be downloaded and donations may be coursed through Nasty Old People’s blog and official site, nastyoldpeople.org. I finally had time to what the whole movie! I must admit I enjoyed it very much! Very well crafted story, decently acted and well shot. Can't believe it was soo low budget! Congrats to Hanna Sk�ld! Great Job – not many directors and producers can turn such a great product for so little money!